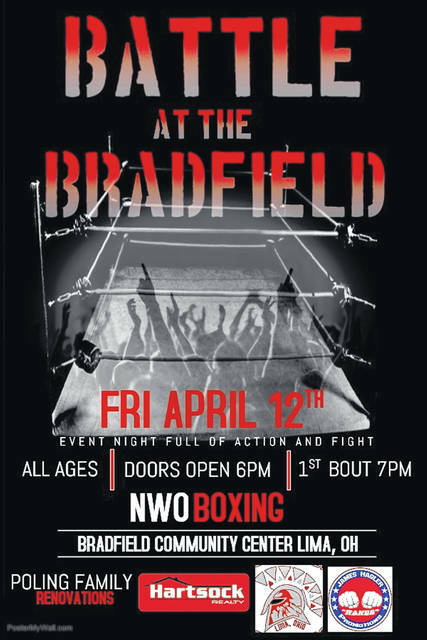 The Battle of the Bradfield NOW event will feature some of the best young boxing amateur talent in the area at the Bradfield Community Center Friday. Gates open at 6 p.m. with the first fight slated for 7 p.m.
Boxers from as young as 10-years-old and up are expected to fight and fans will get to see Taji Breland and Jr. Gamble compete. The two pugilists are two coming off wins at the Tri- State Golden Gloves in Kentucky. The event not only showcases the boxing exploits of some up and coming boxers but it will raise money for the Southside Spartans and help with their new home on 311 Market Street. Southside Spartans moved into their new facility a couple of months ago and it is a vast improvement from the rather cozy confines of the old gym on South Main Street. The new area is around 6,000 square feet. The new gym feature one ring with plans for a second along with a weight area and other amenities to get a proper boxing workout. With all this extra room, Lugo said the boxers will have a much better environment to train in and workout. Lugo added that he feels the new place will attract more individuals to want to come out and added the Southside is branching out into wrestling. Named Pain n’ Gain Wrestling and Say Uncle Fighting, the program will be run by Mason Staley. “That will be starting soon and then later we would like to put a cage in here to start MMA,” Lugo said. The place still needs some fine tuning and Lugo is hoping with this fundraiser and support from the community they can continue to make improvements.